Autumn is a great time for crafting! Dark evenings and colder weather alongside colourful leaves, acorns, conkers and pine cones make it the perfect time for making stuff tucked up at home before Christmas preparations start to take over. Here are 10 easy autumn crafts you could do in an evening! One involves sewing, the rest do not. As long as there are trees near where you live, you will be able to make at least some of these things! The first three are ones I have made myself, the others I have rounded up from Pinterest. All you need are some scraps of fabric and some bias binding! Full instructions can be found here. 2. 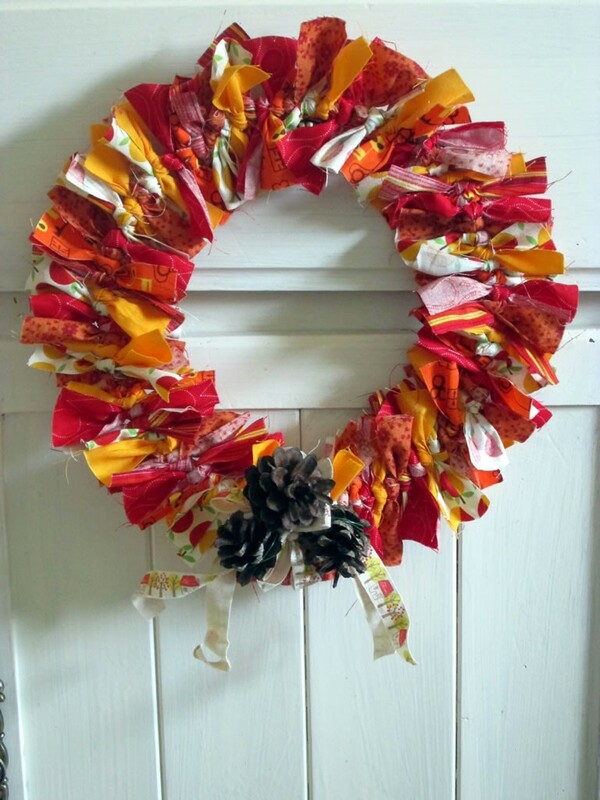 An Autumn Wreath Another good project for using up scraps! Cut up strips of fabric and tie onto a wire ring. Full instructions here. I love stuff that’s free! I used a glass, a jam jar, a vase and a little glass dish, all of which I already had. 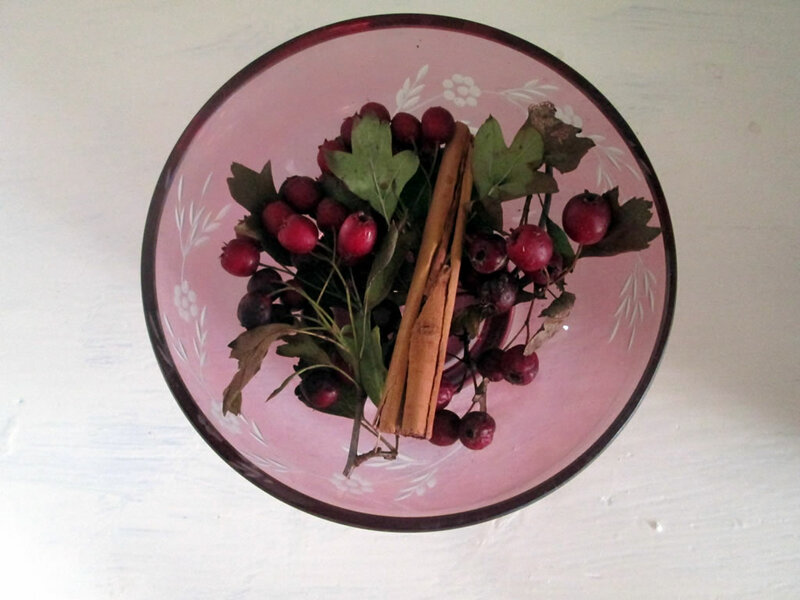 While I was out and about, I gathered up conkers, acorns, pine cones and hawthorn berries. Do not be concerned, nature lovers, I left plenty for the birds! 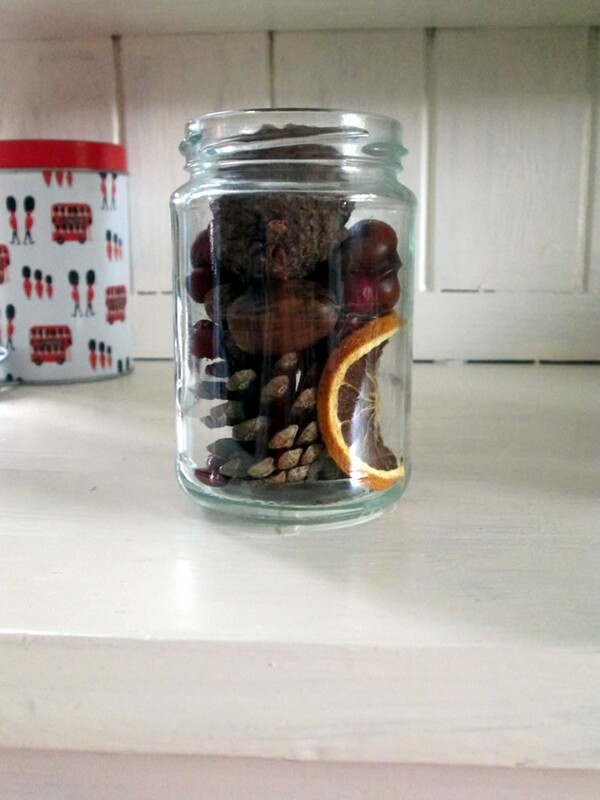 While having a rummage, I also found some pine cones from last Christmas, some dried orange slices and some cinnamon sticks. I chucked the stuff into the glass containers and voila! Just as an aside, the vase with both orange and cinnamon smells like Coke! 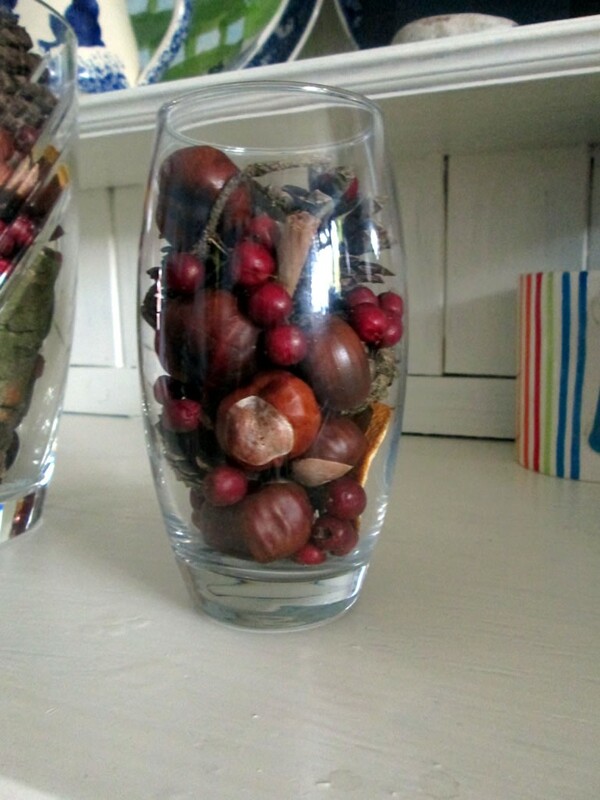 Arrange autumn flowers in a vase. White or grey will show the colours off best. If you don’t have a garden (or a garden but no autumn flowers in it! ), supermarkets often sell bunches of flowers with an autumn theme. 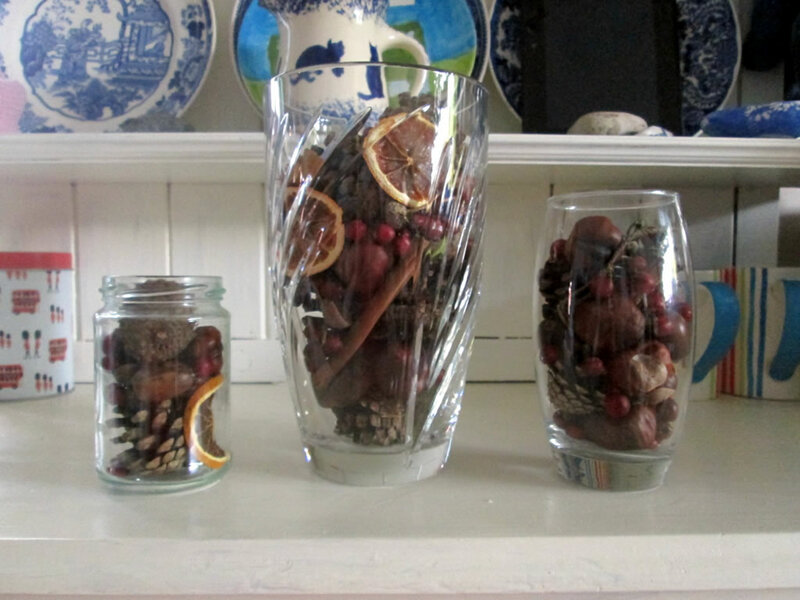 Or you could collect leaves and berries and and arrange them in a vase. The same as #4, just put your vase inside a pumpkin! Gently melt beeswax in a Bain Marie/ double boiler/ bowl in a pan of hot water. Dip the leaves into the wax and hang them up. This prevents the leaves from curling up as they dry out. Preserve pretty leaves by displaying them in a frame. Use coloured paper behind them, calico or printed text. If you have a lot of leaves and a lot of frames, you could make a whole wall of them! 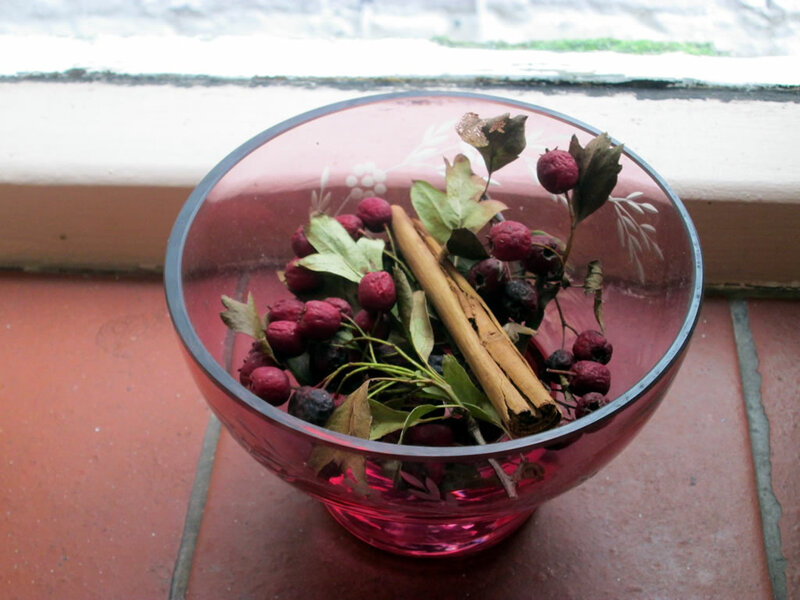 Put berries, conkers, acorns and leaves either inside a jar with a candle or surround the jar with them. Just be careful that the leaves don’t catch fire! Stick leaves to the outside of a jar. The instructions say to use Modge Podge but PVA glue would probably work just as well. Put a tea light inside and you have autumn candle holders! Use paper punches to punch shapes from leaves. The shapes could be displayed in frames or used to make cards or collages. Happy to find your lovely work through Pinterest. 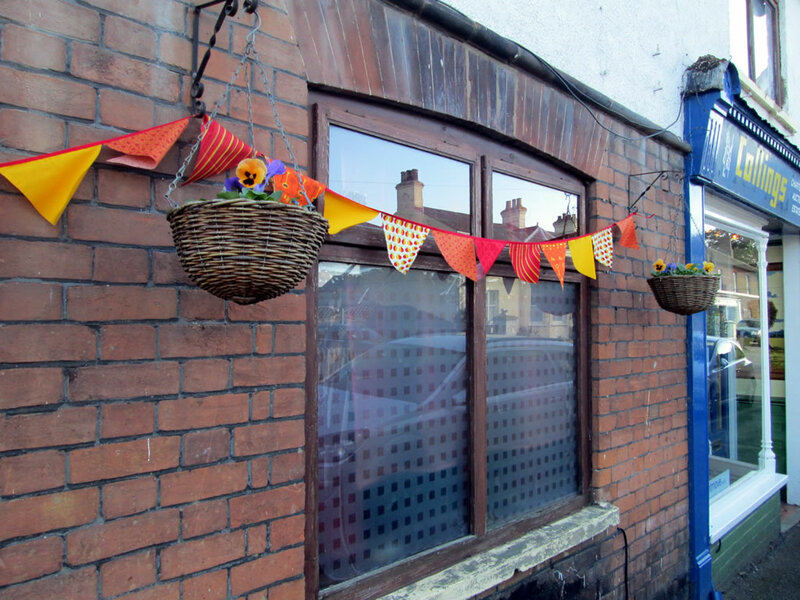 I included a link to your blog post in my “Joyful Reads for the Weekend”, the autumn crafts edition–the link is here if you’d like to take a look: http://www.joyfullygreen.com/2014/10/joyful-reads-for-the-weekend-vol-35-awesome-autumn-craft-ideas.html. P.S. It’s in the “related articles” section at the bottom of the page, and I also pinned it on Pinterest.